As readers, we can be so lucky to encounter that “right book at the right time” experience. That happened to me last year when I read Claire Cook’s Never Too Late: Your Roadmap to Reinvention and I couldn’t stop singing its praises. (I still can’t. Seriously. Read this book!) 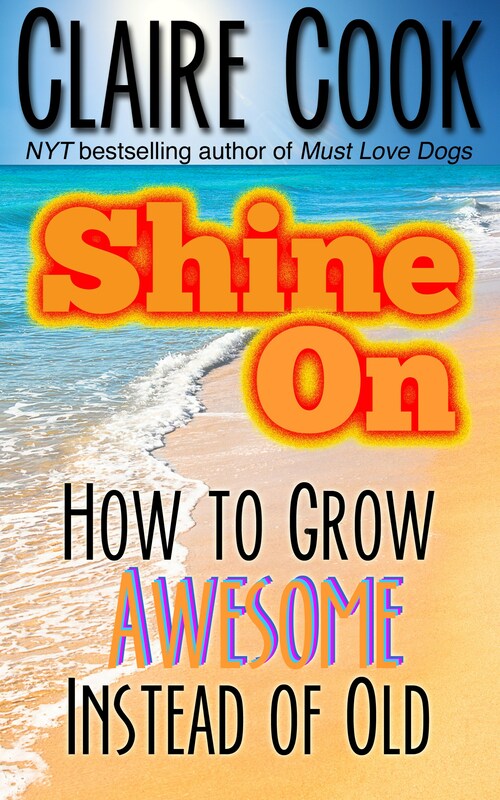 Now, on the cusp of the new year, Claire has done it again with Shine On: How to Grow Awesome Instead of Old, and let me tell you, people: if you want to kick off 2016 with a bubbly bottle of inspiration, you can’t afford to miss this book. Dedicated to “forty-to-forever women,” Shine On offers sage advice not just on aging well, but living well. With her trademark wit and honesty, Claire Cook covers everything from big picture motivation on following your dreams and remembering to have fun, to practical, hands-on tips on fitness, healthy eating, her favorite beauty products, and the many wonders of coconut oil. (Note to self: Must remember to pick up some coconut oil. Who knew it can be used for almost anything?) Sharing deeply personal stories about her successes, mistakes, and set-backs, Cook reminds us that even on days when it might not seem like it, there are opportunities to embrace our own awesomeness around every corner. Claire Cook’s wisdom, candor, and effervescent enthusiasm shine on in every word she writes. When reading her books, you feel like she’s sitting across from you, talking about what she’s up to, what she’s learned, and that really cool thing that happened to her the other day. Even when offering advice, she acknowledges that what works for her might not work for everyone, and she shares pointers on how we can define and create our own versions of awesome. As someone in my thirties, I may not be the exact target audience for this book, but it absolutely hit home, and each delicious chapter filled me with more and more inspiration. Honestly, who among us doesn’t need a boost every now and then, a cheerleader reminding us to be our very most fabulous selves? For those who consider Never Too Late a personal roadmap, Shine On makes the perfect successor. This book is a great motivator not just to the fantastic forty-to-forever women it’s dedicated to, but to anyone looking to add a little more sparkle to their lives. Shine On is now available at Barnes & Noble, Amazon or wherever you buy your books! For more on the shimmering, inspiring Claire Cook, be sure to follow her on Facebook and Twitter, and pop over to clairecook.com to learn more about her other shine-tastic books! Thank you SO much for this fabulous, beautifully written review, Stephanie! I’m so glad you enjoyed Shine On, and I wish you lots of joy and success in 2016! Thank YOU, Claire!! Thank you for sharing your fantastic books with the world!! !